SAINT LOUIS (Sept. 17, 2013) – As emerging technologies continue to shape how consumers interact with brands, seamless, user-friendly experiences across all touch points have become an imperative. Lamar Advertising Company (NASDAQ: LAMR), the nation’s leading out-of-home advertising company, needed to improve and modernize its existing web presence – www.lamar.com – to deliver a better user experience. The company partnered with Perficient, Inc. (NASDAQ: PRFT), a leading information technology consulting firm serving Global 2000 and other large enterprise customers, to transform Lamar’s web experience. Together, Lamar and Perficient created a fully responsive website that is accessible on any device, and enhanced the quality and availability of information to visitors. With more than 200 locations across the United States, Canada and Puerto Rico, Lamar provides clients with outdoor advertising solutions in the form of billboards, digital, transit and highway logo signs. Lamar has grown significantly in the past 20 years and continues to diversify its offerings as technologies enter the market. However, the company’s website didn’t fully reflect that growth and diversification. Each of Lamar’s locations had individual marketing websites, which lacked continuity and resulted in a disconnected approach to engaging customers and providing localized content to the public. Lamar and Perficient embarked on a strategic website redesign project, which required selecting a web content management system that would accommodate a corporate website as well as office-specific content management for its numerous locations. The company also needed a platform that could scale to engage customers how and when they wanted to engage. Given its requirements, Lamar selected Sitecore CMS as its content management system, which is based on Microsoft’s .NET platform. As a result of implementing the Sitecore CMS platform, Lamar’s website has increased customer awareness, allowing the company to address customer needs on both a local and national level. In addition, Lamar has experienced increased conversions, has the ability to reach, engage and educate potential customers about out-of-home advertising, and has reduced time-to-market for new content and communications, enabling continuous improvement of the website. Perficient, a Sitecore Certified Solution Partner, will host the webinar “How Lamar Created an Engaging and Mobile Website” on Wednesday, Oct. 16 at 1 p.m. CT. During the webinar, Perficient’s Lead Sitecore Consultant Candace Hoeksema and Lamar’s Creative Director Mendi Robinson will discuss how by implementing Sitecore CMS Lamar can better serve its customers through more personalized and engaging content and a powerful user experience. Click here to register. Learn more about Perficient’s expertise in Sitecore and Microsoft technologies. Follow the team online via the Perficient Microsoft Community blog or via Twitter @Perficient_MSFT. Lamar Advertising Company is the nation’s leading out-of-home advertising firm. Lamar offers solutions for clients in the form of bulletins, posters, digital billboards, buses, benches, transit shelters and highway logo signs. Founded in 1902, Baton Rouge-based Lamar has a broad corporate reach with over 200 media companies across the United States, Canada and Puerto Rico specializing in outdoor and transit advertising. In addition, Lamar has 22 media companies devoted to the highway logo sign business. This network provides clients with local market insight, as well as the services provided by a firm on a national scale. For more information, please visit www.lamar.com. 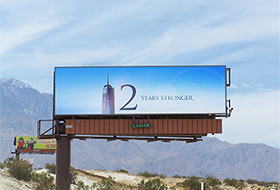 For the 12th anniversary of September 11, 2001, Lamar Advertising Company is launching a digital billboard campaign to help maintain awareness about the tragedy that occurred that day at the World Trade Center.